Former leader of the Libyan Islamic Fighting Group, Abdel Hakim Belhaj, waves prior to his speech as Libya’s transitional government declares liberation of Libya, Oct. 23, 2011. The “smoking gun” is that when Prime Minister Theresa May was Home Secretary, LIFG jihadists were allowed to travel unhindered across Europe and encouraged to engage in “battle”: first to remove Muammar Gaddafi in Libya, then to join al-Qaida-affiliated groups in Syria. Last year, the FBI reportedly placed Abedi on a “terrorist watchlist” and warned MI5 that his group was looking for a “political target” in Britain. Why wasn’t he apprehended and the network around him prevented from planning and executing the atrocity on May 22? 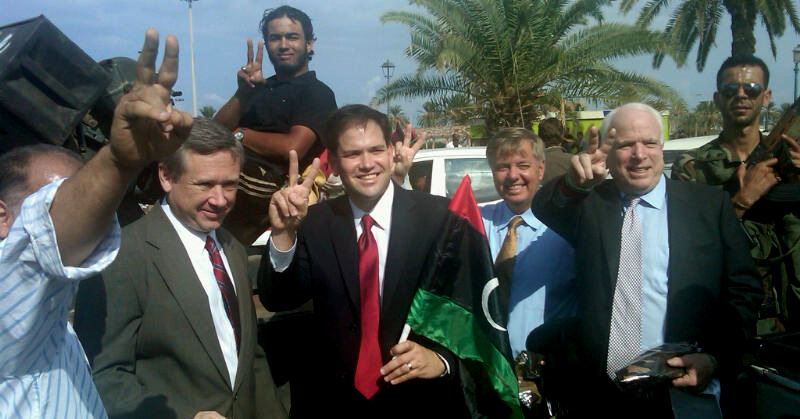 Neo-conservative Republican Senators Mark Kirk of Illinois, Marco Rubio of Florida, Lindsey Graham of South Carolina, and John McCain of Arizona, visit Libya not long after Gadhafi’s fall. John Pilger is an Australian-British journalist based in London. Pilger’s Web site is www.johnpilger.com. His new film, “The Coming War on China,” is available in the U.S. from www.bullfrogfilms.com.